With the usual lens, mirror and straight scale method of reading deflections, the indicated value is proportional to the tangent of the angle of deflection. In many instruments, for example in extensometers, in which the motion is communicated to the mirror by the rolling of axis of mirror or by a pinion and geared sector a deflection on a plane surface proportional to the angle of deflection is desirable. This is particularly true if deflection is registered on a moving photographic film as it gives an equicrescent scale in each direction. 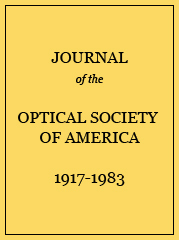 A simple two lens system which can be satisfactorily made on standard spectacle tools has been designed which introduces distortion sufficient to give desired relation between deflection and indicated value and at the same time gives notable flattening of field, thus permitting the photographic registry of very large deflections. Other simple relations between deflection and indicated value may be secured by redesign of the projecting system.